What could be better than giving the one gift this Christmas that would bring a smile to child’s face? In our land of plenty, it’s a joy to know that many children are not just satisfied but elated over one small shoe box filled with small gifts. Operation Christmas Child, a project of Samaritan’s Purse has been sending out shoe boxes packed with gifts to children all over the world since 1993. If you’ve never been a part of this amazing opportunity, I encourage you to head over the the Samaritan’s Purse website and read all about it. The packers (people like you and me) choose whether they will pack a box for a boy or a girl and what age child will receive their box. This is a great project for children, especially now that Samaritan’s Purse makes it possible for packers to trace their boxes all around the world. We’ve been packing shoe boxes at our house for quite a few years. When Justine was here with us, she enjoyed helping to choose gifts for the recipients of our boxes. We’ve packed boxes for boys and girls, and we’ve chosen different age groups different years. Some of our favorite items to include are crayons, pencils, stuffed animals, toothbrush and toothpaste, soap and a washcloth. The website has lots of suggestions and a list of items that are not permitted, too. I saw lots of great ideas for shoe box gifts on Pinterest, too. The boxes are collected at churches and other locations during the middle week of November, and that is why I’m blogging about this now. It’s not too soon to decide to pack a box, choose the gender and age of the recipient, and start shopping! Samaritan’s Purse also asks for $7 to be included in each shoe box to help cover the cost of shipping the boxes worldwide. 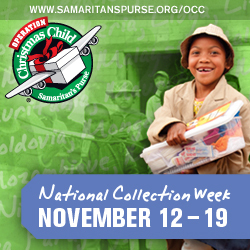 Have you ever packed a shoe box for Operation Christmas Child? If so, what are some of your favorite items to include? If you haven’t ever packed a shoe box, then what are you waiting for?